The Parabellum windscreen for the 2014 Yamaha Super Tenere is made of 3/16 inch military aircraft grade cast acrylic and is a direct replacement shield attaching to the stock mounts and retaining the adjustability. The Parabellum windshield is 18 inches wide tapering at the top to 15.5 inches. (stock screen is 16.5 inches tapering to 12.75 inches at the top) It comes complete with new fasteners and accommodates the stock hand guards with no clearance issue at full lock. The Parabellum windscreen turns this big adventure dual sport bike into a great touring machine that you can log lots of comfortable turbulent free miles on. It is offered in three heights and in clear or tint. 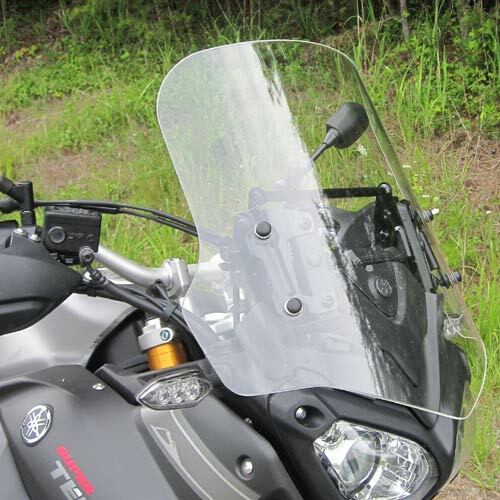 After trying several different windshields for my 2015 Super Tenere, I had not found one that would provide smooth air. The Parabellum had received many positive comments on the forums, so I decided to give one a try. I placed an order for the small 21” screen. My order received prompt attention from the company, as I received a personal phone call the same evening of the day I placed my order. That in itself was a good sign for me. The nice lady (Brenda?) asked about my height and inseam, then recommended that I go with the tall 25” screen. I was a bit leery at first, as I do not care to look “through” a windshield, but rather, over top of it. I was afraid the 25” would be too tall, as I have a long inseam and short torso. After assuring me that they would cut the screen down if I did not like the height, I ordered the 25” screen. I need not have worried. Turns out the 25” screen is exactly the right height for me. I can see over the top of it by 2”-3”. It also provides very smooth air. I can actually read highway signs at a distance again at interstate speeds! I have ridden with it on a windy day, and the screen is very sturdy- not flimsy at all. As large as the screen is, I was surprised that I wasn’t being blown around the highway nearly as much as I had with another company’s aftermarket screen. This screen makes the bike easier to handle on windy days! Overall, the quality, fit, and finish of the Parabellum is excellent, the screen actually works like it is supposed to, meaning I can ride all day for many days and never give a thought to it (except to clean the bugs off once in a while!). Just order one, and go with whatever size they recommend. You’ll be glad you did!